It's Friday! Yea! Cooling down now during the night and the days are getting shorter. It's dark when I get up and gets dark earlier in the evening now. Fall is surely in the air and the leaves are falling. We have two big old chestnut (Horse Chestnut, not the eating kind) trees in our front yard and every year children come with their bags and collect the chestnuts, and each night, the deer come and graze and eat them off the lawn. When we rake leaves, we also rake up lots of chestnuts, so we put them on a tarp and drag it to the field across the street from us, so the deer can feed off them. Ah Fall. It's a pretty simple card. The Digi is by Glitterbabes. I printed the digi twice, once on plain white card stock and next on red gingham. I cut out the gingham and paper pieced it. Ribbon sentiment is a spool from Michael's dollar bin. I put Glossy Accents on the apples to make them shiny. Colored with Copic Markers. such a lovely card sue, colorful colors. WOW! 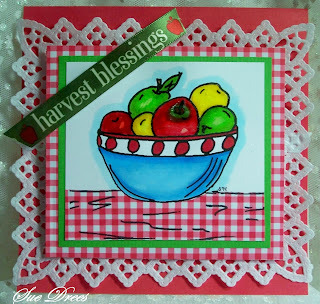 Your harvest blessings card is absolutely beautiful! That fruit looks fresh picked!! LOL!! LOVE all the gingham too ... another beautiful creation for our progressive challenge! Thanks so much for joining our challenge fun at CDAC and I look forward to more inspiration from you in Round #4! Have a wonderful day/weekend! Sue your card is just so charming. I love gingham and how you add some wrinkles to the tablecloth. I love your little story about fall. Fall is my fave time of year. Sounds like you live in such an awesome area. Sue, this is wonderful, love the bright colours, the gingham and the fruit image! Fall is in the air here too, we are having cool nights and warm afternoons, still awaiting the first frost ( not looking forward to, but waiting LOL). The deer are mighty lucky at your place,getting all those chestnuts to eat..
Just found your blog today and the story about the horse chestnut tree caught my eye as I have one in my yard too. But no deer nearby to eat them. I'm originally from New York, born in Poughkeepsie now living in California. Loved your card. Nice to meet you. How cute. This makes me think of Grandma's with the gingham accents and the doily background. Just lovely.